When you first launch Blocs you will be asked if you would like to run the app as a trial or if you would like to activate the full app using a valid license number. If you have purchased a license from us, after you have completed your transaction, you will have been automatically redirected to a page containing your number. As well as this, you will also receive an email from us containing your license number. If you didn’t receive a license number via email, please check your spam inbox. Our emails can occasionally be mistaken for spam due to the fact they contain odd character combinations, i.e. your license number..
Activating your copy of Blocs is very simple. When you choose to activate your license, you will be presented with the License Details window. In the first input field labelled License Number, enter your valid Blocs license number. In the second input field labelled Email, enter the email address used when you purchased your copy of Blocs. After you have populated both input fields, click the button labelled Activate License. 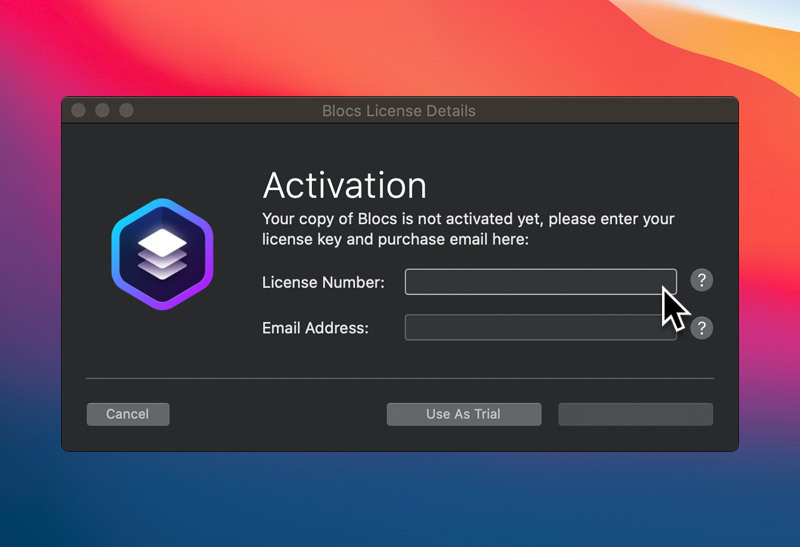 Blocs will now run on your Mac as a fully licensed copy. If you are still having setup issues and would like to get in touch, you can contact us here.